Far right parties are here to stay and, if unchecked, they will continue growing. The way to halt this process – risky as it may seem – is for the mainstream to try to tame them, argues Harry Nedelcu. 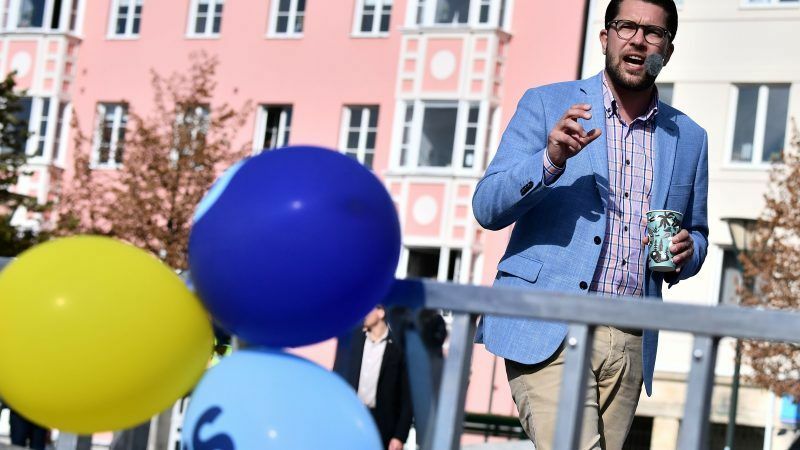 This Sunday, Swedes have kicked-off a new election-cycle that will include more than 20 Western democracies over the next two years. As expected, Social Democrats did see their worst result in over a century and the populist Swedish Democrats have indeed increased their seats, although the results have been less pessimistic than what many polls predicted. The question now is what to do next, given that neither the centre-left nor the centre-right have a majority in government. As counter-intuitive as it may seem, the best way to address the rise of far-right in Sweden – and all over Europe for that matter – will be to seriously consider inviting them to form a government. In neighbouring Norway and Denmark but also in the Netherlands, whenever the mainstream invited populists into coalitions, they managed to domesticate them, socialising them into the day-to-day work of government, and moderating their positions over time. Most importantly, when populists are perceived as no longer ‘outsiders’ but ‘in bed’ with their former rivals, they lose their populist appeal as well as their arguments. Their electorate sees them for what they are – political entrepreneurs rather than messiahs – and as a result, they fail to gain more votes. Until now, the Swedish Democrats have been a fringe party and, like elsewhere in Europe, the main parties employed a simple yet instinctive strategy when dealing with them – create a cordon sanitaire around them, keep them far from government, even if at the expense of cooperating with each other. This strategy is not working. Populists have been using this against the mainstream by presenting themselves as victims of a political elite that is colluding across party lines. As a result, with every election since the 1990s, they have been progressively gaining ground. The far-right has been exploiting every missed opportunity, any crack, and every shortcoming mainstream politicians may have, including grand coalitions. They challenge not just established parties but often our institutions and even our liberal democratic values as a whole. In recent years this has coincided with authoritarian regimes increasingly interfering in our democratic processes, seeking to amplify divisions, polarise electorates, sow confusion among citizens and likewise make us doubt our own democratic institutions. The two are natural allies. The Kremlin, for instance, has been supporting the far-right all over Europe, including France, Hungary, Austria, and Italy. In Sweden, the Swedish Democrats have been shaping the debate on immigration and the Russian-sponsored media has been quick to add fuel to the fire with fake news and innuendo while obscure websites publish fake news seeking to incriminate Swedish officials. This follows a pattern well known and quite documented by now throughout previous elections in Europe and North America. The Danish experience of co-opting populists, however, may hint towards an effective way in which foreign election interference can be curtailed as well. In July 2018, a Russian embassy tweet stated that since there is no difference between Danish political parties vis-à-vis Russia, “meddling into Danish elections makes no sense”. Simply put, Russia itself is telling us that it would meddle if it could, but in Denmark, it can’t find useful political groups to support. This is something many other democratic states could learn from. Russia’s interference has been moving way beyond traditional fake news. It now tends to amplify and distort stories that are based on truth but which help sow division and confusion among electorates. One way to deprive Moscow of these tactics and win over interference once and for all is by addressing issues people care about head-on and co-opting populists rather than giving them more ammunition. The bottom line is that far-right parties – in Sweden and throughout Europe – are here to stay. They came about in the 1980s, grew progressively over the last two decades and if unchecked they will continue growing. The way to halt this process – risky as it may seem – is for the mainstream to try to tame them. Europe’s political mainstream should turn its attention to ‘taming’ Islam, migration and low indigenous birthrate. Because that are the diseases of our society and culture that threaten to wash away western culture and people into the waste-bin of history.